In this post we’re pleased to feature another guest contributor, Nick Planas. Nick contacted our project earlier in the year, offering details of an accident which resulted in the death of one of his ancestors in the 1890s. Although currently outside the timeframe of our project, it was of course still of interest, and Nick kindly agreed to put the details together as a blog post. This is just the sort of thing we’re keen to encourage, so if you have a similar case in your family background and would be prepared to ‘write it up’, do let us know: railwayworkeraccidents@gmail.com. The personal touch here is lovely – we get a sense of the research process but also a connection to the accident and those involved, something that might otherwise be missing from more official sources. I am a composer, performer and teacher of music, now living in Brackley, Northamptonshire, but originally from Iver Heath in Buckinghamshire, just down the road from Pinewood Film Studios. I am also an experienced amateur genealogist, of which more below. Being brought up in the 1960s, I have retained a fascination with railways, born from having a father who mourned the end of the steam era, and who also hand-built his own clockwork model engines to go on our Hornby ‘O’ gauge track. In the 1970s I briefly worked as a part-time print messenger, using the Underground extensively each day. I have a few memories of working in London during the IRA bomb threats, and was always aware of the potential risks the Undergound and other public transport staff faced daily. During this time I also read O.S.Nock’s Historic Railway Accidents and L.T.C.Rolt’s Red for Danger and these sparked a lifelong interest in railway accident history. Any morbid curiosity I may have had was soon replaced by a fascination with how ordinary people behave at times of stress, and also how calm and mainly scientific enquiry after the event has helped to evolve safety systems which we take for granted today; later on these methods were applied to the aviation industry, and of course the general Health and Safety culture in the workplace. In 1983 my wife was expecting our first child, and I began a lifetime’s quest – the never-ending search for every one of my children’s ancestors. Not for me the easy option of just chasing one surname; no, I had to know about all of them! In the 1980s and ‘90s this meant visits to St Catherine’s House to check the massive index volumes for Births (red), Marriages (green) and Deaths (black). Fortunately, the internet arrived and various websites appeared which helped refine our searches, and having moved to Brackley it was a great relief to be able to do research from the comfort of my studio, instead of trekking all the way to London in what little spare time I had. I am now a full member of Ancestry.com and it was through a link with them that I discovered the ‘Railway Work, Life & Death’ project, whilst doing a general railway search on behalf of a relative whose father worked for the Great Western Railway in the 1900s. 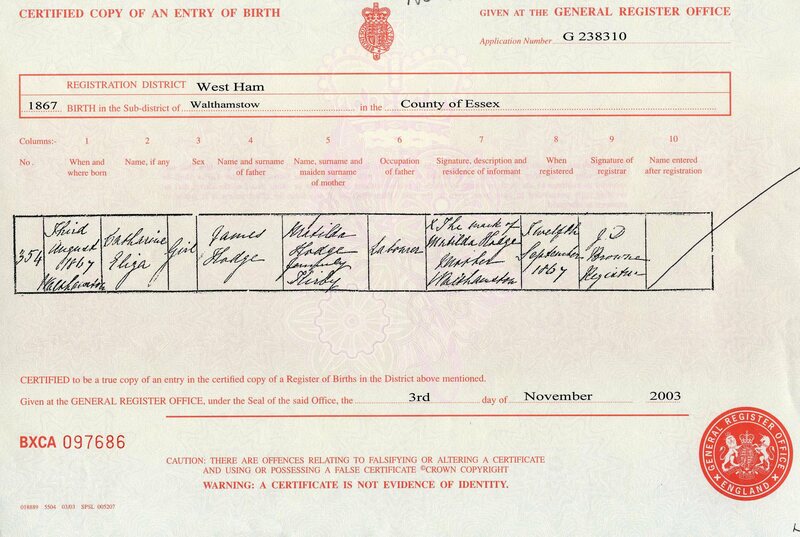 My ancestry quest was fairly successful, and being somewhat ‘nerdy’ about my hobby, I resolved to obtain every ancestor’s birth, marriage and death certificate – or for the earlier generations, copies of their baptism, marriage and burial entries in the various parish registers. Inevitably there were gaps due to lack of knowledge, and common surnames, and one of the problems I had on my wife’s side was a family rift between her grandfather and his family, apparently due to his choice of bride. I suspect it may have had something to do with the denomination of his family’s church – we don’t know and the people concerned aren’t around to tell us. What this meant, however, was a total lack of oral history to help me trace his ancestry. However, after some painstaking research I was pleased to be able to tell my father-in-law something of his paternal ancestry before he passed away in 1997. Until I did the research he hadn’t known the names of his paternal grandparents. His paternal grandmother was named on his father’s birth certificate as Caroline Eliza Driver, formerly Hodge. A check with the various census returns showed her listed as Eliza Hodge, so it appears she rarely if ever used her first name; her marriage certificate shows her as just Eliza, and her father as James. After much searching, and cross checking with the earlier census returns, I found her birth registered as Catherine Eliza Hodge, daughter of James Hodge and Matilda, formerly Kirby. 1867 Eliza Hodge birth certificate. Courtesy Nick Planas. All well and good, but when I came to find out more about her father, James Hodge, I found a common name (his father was also named James) that was ripe for mis-indexing. At various times he was listed as James Hedge, John(!) Hodge, then also Hodges and Hedges. I was also missing his death certificate; I narrowed it down to two or three choices, and eventually pinned his death down to between 1891 (where he’d appeared on the census) and 1897 when his widow had remarried, took the plunge and ordered the most likely death certificate. 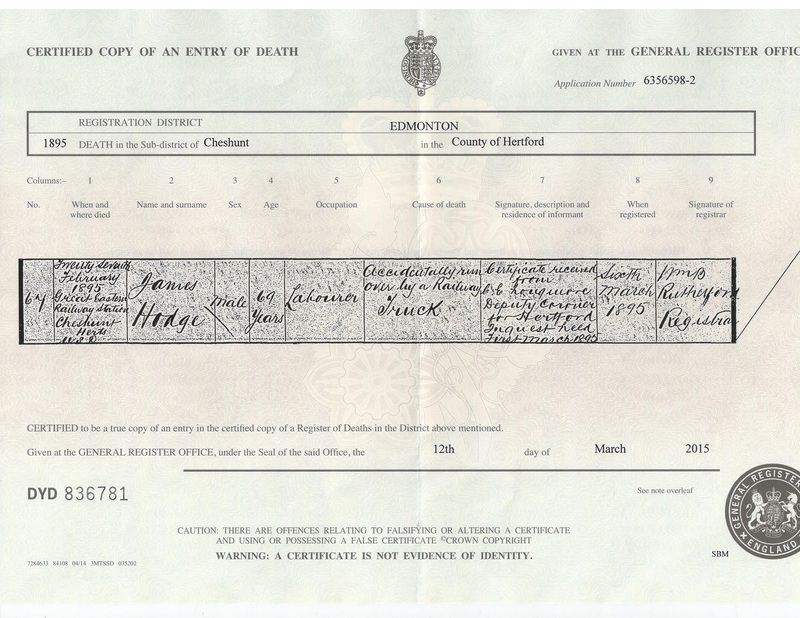 James Hodge’s death certificate (27 February 1895). Courtesy Nick Planas. However, this was where my research ground to a halt again, for the certificate did not name any relatives; instead it showed that this particular James Hodge been run over by a railway truck at Cheshunt Station on the Great Eastern Railway. The certificate had been issued on the orders of the coroner, and I knew that most coroner’s records were unavailable, so I still didn’t know if I had the right James. Cheshunt station & surrounds, 1912. Straight away I looked for an official report into the accident, using The Railways Archive (www.railwaysarchive.co.uk), a website which aims to digitize and publish every railway passenger accident report in the UK. There was nothing listed for the date and place concerned, as this was not a passenger accident. However I had recently subscribed to the British Newspaper Archive as well. Now, newspapers back in the 1890s were somewhat different to today’s tabloids! There were still sensationalist reports, and headlines which helped to sell, but newspapers then were also the only medium available for daily news and so they would report things such as coroner’s inquests in great detail. I discovered that James’s death had been reported in the Hertfordshire Mercury, and the inquest was reported in some detail. There was a little eureka moment for me too, as the report named his wife as Matilda, so I knew I had the right James. Sad as this tale is for his family at the time, I was satisfied that I had now found out all I reasonably could about the life of this man, my wife’s great great grandfather. Incidentally, the report gives his address as Cheshunt Mill Lock. James’ widow Matilda went on to marry the lock-keeper in 1897 – I can only speculate that as he was a widower, perhaps the families were friends of long standing and it was a comfort to both of them; sadly her second husband died two years later, but Matilda lived on until 1917. Hertfordshire Mercury (9 March 1895), p.6 – reporting on the case. Courtesy Nick Planas. This is a tragic tale, of course, and looking at the results of the research done on this website, it is easy to understand the huge impact every one of these accidents had on the families, friends and colleagues of these railway workers. My ancestral quest has highlighted many tragic incidents over the years, but I have managed to detach myself emotionally from them to a great extent. I take the pragmatic view that if the accidents had not happened as and when they did, the likelihood is that either I or my wife wouldn’t be here today. I do, however, still find myself shedding the odd tear when I see the burial records for very young children, infant mortality being one of the scourges of human history. As a postscript, we’d like to pick up a couple of additional points about this case. Firstly, James Hodges’ employment. He was employed by a local merchant to unload coal at Cheshunt station, so wasn’t working directly for the Great Eastern Railway company. However, cases like his do still feature in the railway worker accident reports from which our database is drawn – such accidents happened on the railways, and so fell within the remit of the Railway Inspectors. Secondly, from the newspaper report, the coroner’s inquest saw fit to note that ‘deceased was quite sober at the time of the accident’ – something that would perhaps be seen as a slur today, implying that there might have been some doubt about it, but presumably more reflecting the need to look at all eventualities. Finally, Nick’s work on James Hodge’s accident demonstrates a nice marrying up of lots of different sources – something we want to do more of in our project.